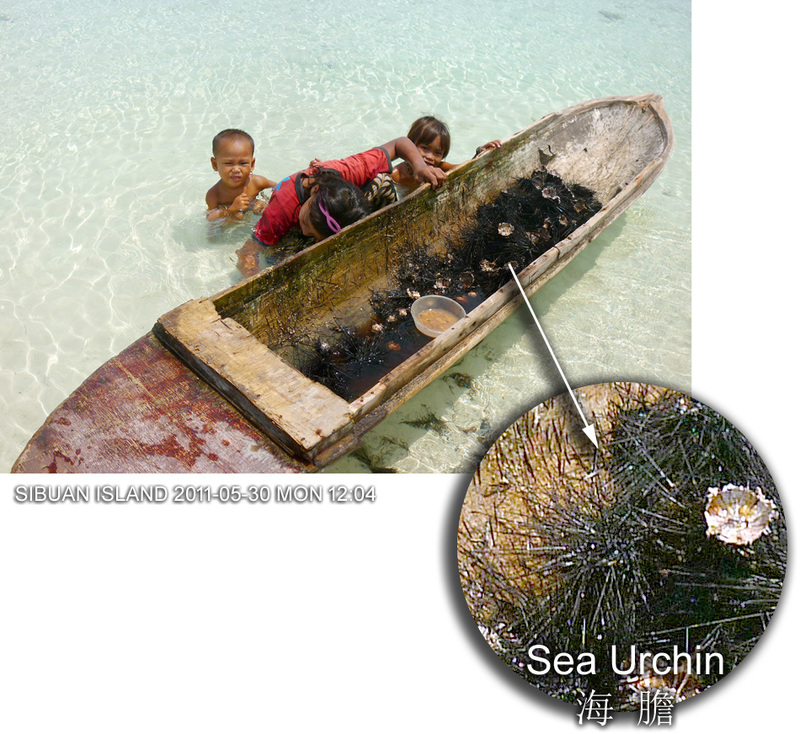 Sea Urchin 海膽 spiny exteriors may not look appetizing, but they are prized around the world for their fishy-flavored roe and flesh. They are often eaten raw in Japanese sushi. 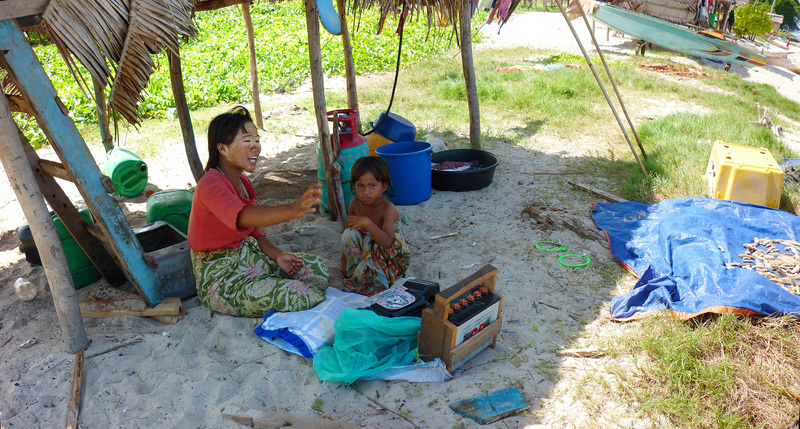 Under the shade of their small hut, mother and child listening to favorite songs from a CD player powered by a car battery. 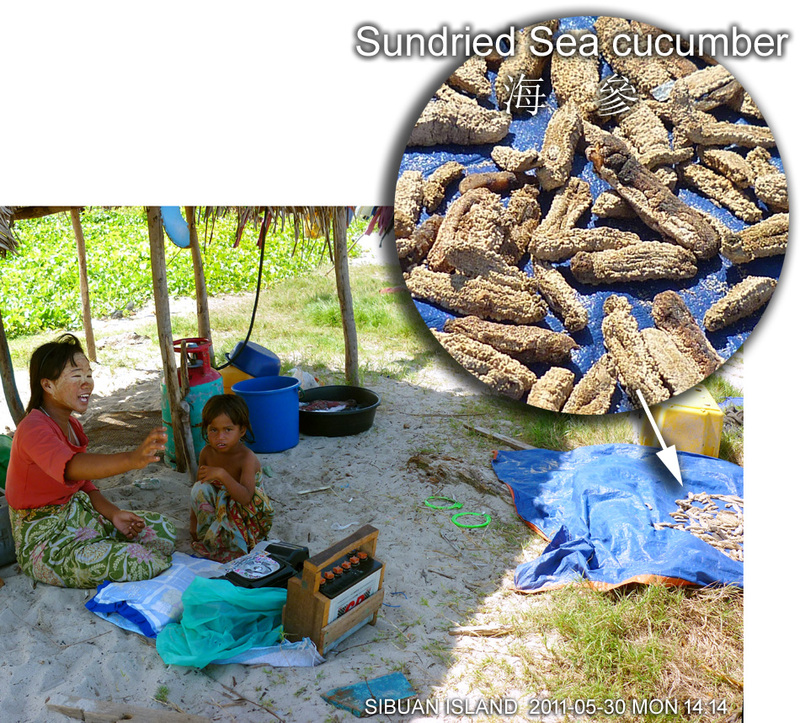 Sea cucumber drying under strong tropical sun. Fetch a good price in the city. But ignorant islanders are often exploited by middle men. 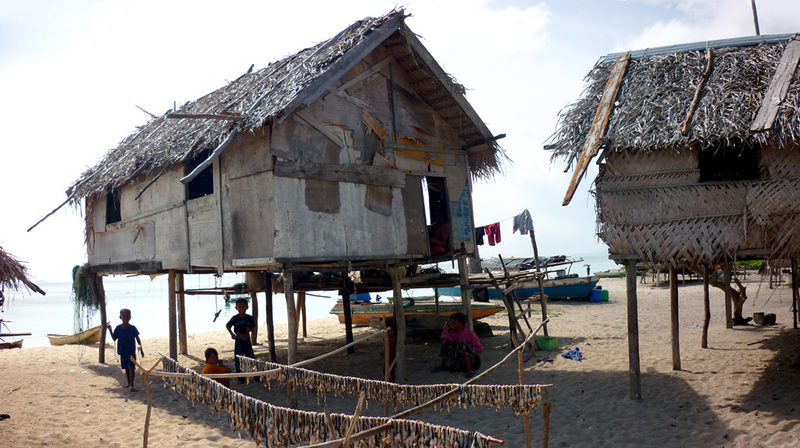 Only in recent years, Bajau children on islands have picked up the undesirable behavior of reaching out a hand to passing tourists for money or something. Please do not entice them with money as this will spoil the islanders' society. Please DO NOT give children money to act for your shot. There are generous tourists with real intention to help pity children by using the excuse of that they pose for photos in return for tips. To the children, this ruin their mentality. No matter how much money or foods you given to the kids, the children will never benefit in return from your "charity", they never become richer, they never become happier. Increasing number of kindhearted visitors wanted to do children charity. If you want to help, help their parents instead by "trade strategy". If you are determined to see some things to children, you can always support their "economy" by using the "trading strategy" toward the adults. That is to "find excuse to buy something" on the island from the adult, particularly from the female, so that you have a proper reason to leave some money behind. Children benefit directly from you via their mothers. - anything you can create "value" out of it. Even you will not eat the fresh or dried sea foods you bought, you can always as gifts to helpful people at your hotel such as boatmen, drivers, workers. Even you will not bring the shells back to USA, you can always drop them back to the sea from the returning boat trip. 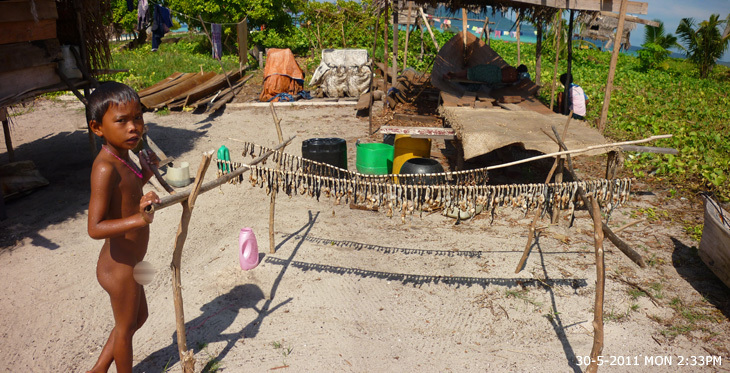 This "trading strategy" is an effective, positive and wisdom method in helping the local islanders at the very personal and direct level. 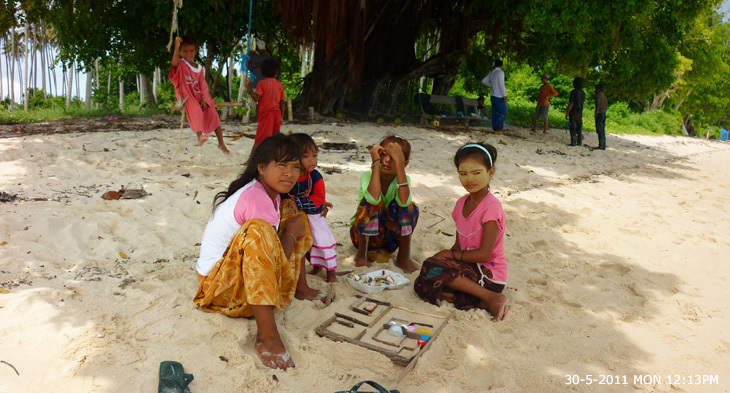 By improving the "economy" of the adults on the islands, the children livelihood effectively improve. So give nothing to children but "trade" generously with their parents. 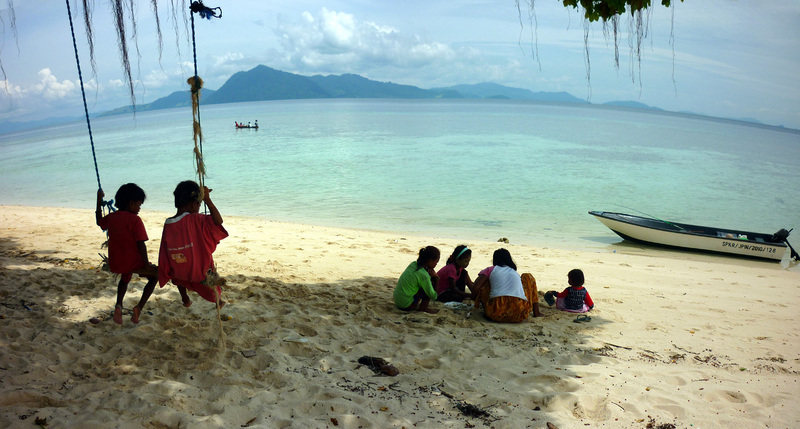 On Sibuan Island is a small village of about 10 families sea gypsies who live beside beautiful beaches of white coral soft sand. There is no hotels accommodation on such a small island and all tourists come here on day trips . 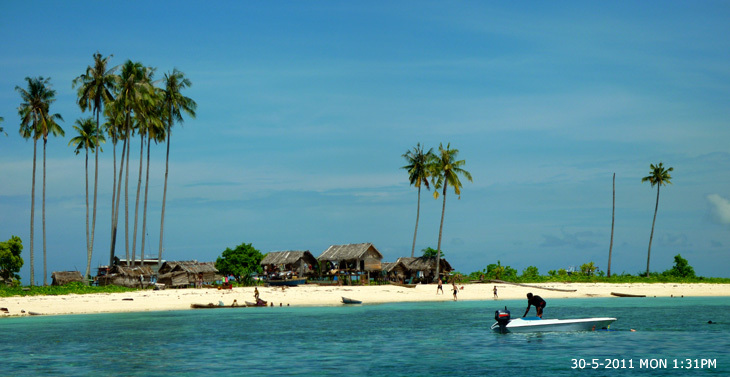 This beautiful island in the Celebes sea is only 30 minutes by boat from Semporna Town of Sabah. The Bajau Laut ethnic community (the Sea Gypsies) traditionally live in sprawling stilt villages above water or on land. Some inside the traditional Lepa boats. Sibuan is one of the smallest islands in the whole bay. 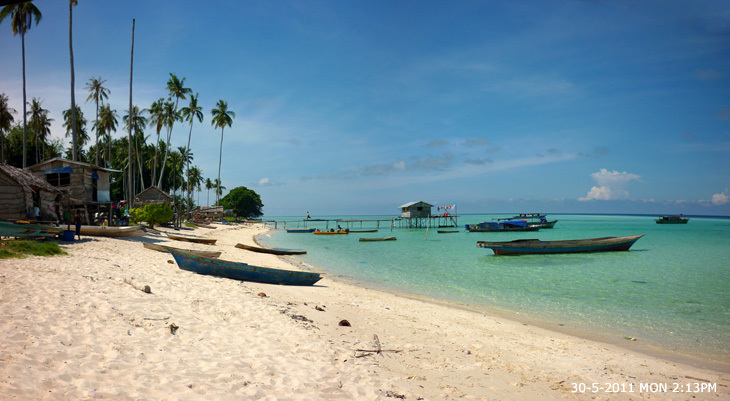 Popular for swimmers and sorcerers and one of the most photographed islands in Sabah. 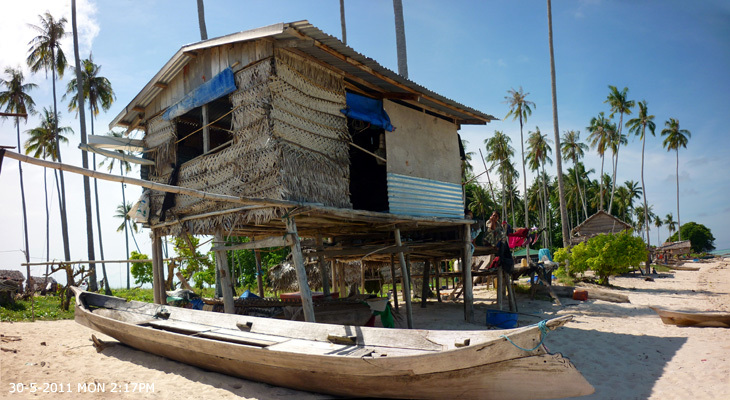 "......The Bajau, the nomads of the sea, are neither recognized nor accepted by the neighboring countries, but are there by choice, the choice to live in paradise, their own little paradise....."
Dalok Bin Mangona is one of the few remaining Boggo' boat makers in Malaysia. Using two choppers and one chisel (see above photo), Dalok patiently dug a Boggo boat out of a solid length of log. Boggo is a simple dugout boat 2 to 5 meters in length. Use exclusively inshore over shallow sea. The people of these islands have for centuries of adaptation to tropical riverine and maritime environments. 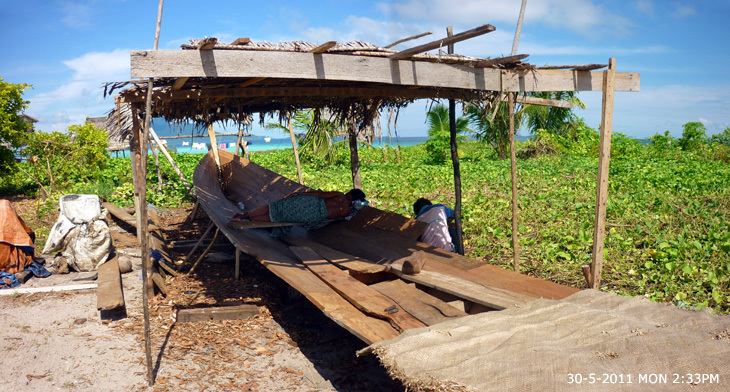 As a result the people of seas have created hundreds of different kinds of boats. 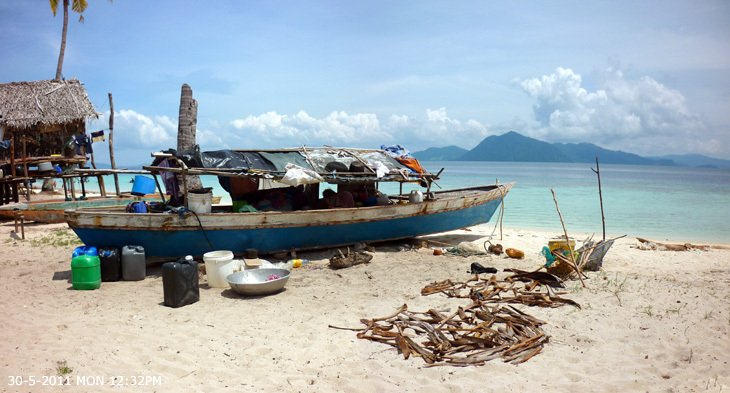 In Malaysia, the new generations moving onland and the availble of industrial produced boats, the skills of boat making of these islanders are disappearing. Dalok Bin Mangona is one of the few remaining watercraft masters in Malaysia. 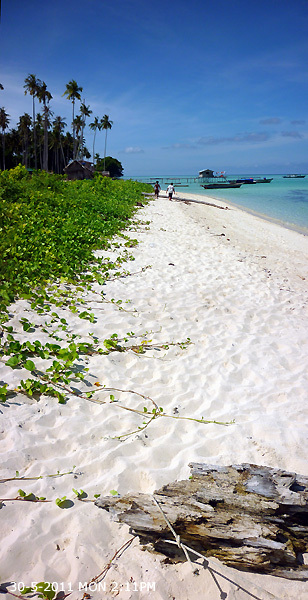 White sandy beach perfect for swimmers and non swimmers alike. Cuttlefish, turtles and sting rays are seen here often other then mandarin fish, frog fish, pygmy seahorse and ghost pipe fish. 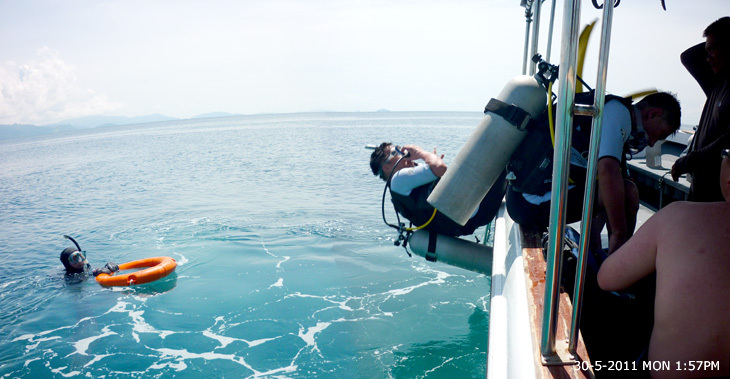 With a combination of shallow plateaus and steep slopes, the island is a regular stop over during open water diver courses and experienced diver programs. Long and narrow with triangular shape viewed from above. At the south is a long narrow strip of sand, which gets flooded at high tide. 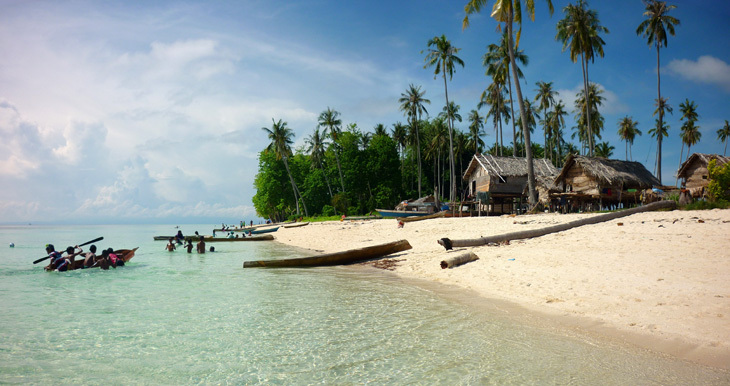 In the center of the island is a small forest and the beaches are lined with coconut trees. 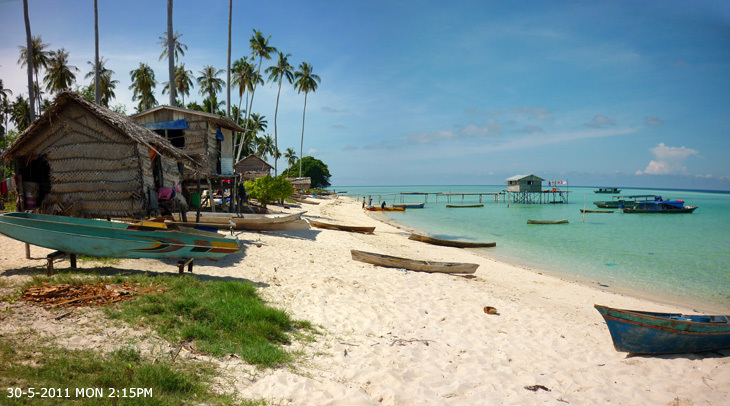 At the northern end there is a small military base of Malaysian soldiers to guarantee protection against pirates. The only area suitable for swimming is the southern end, because elsewhere you have to wade through the coral banks before being able to reach the sea. 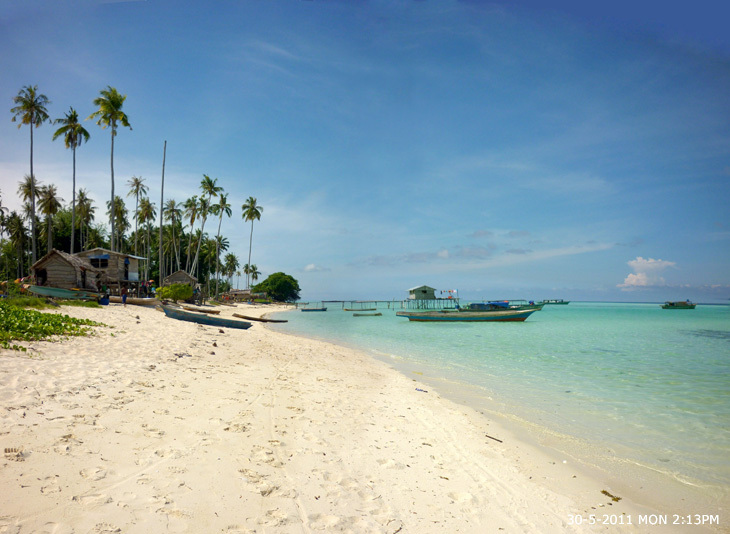 The sea water is crystal clear, but underwater visibility is limited to less than 10m. 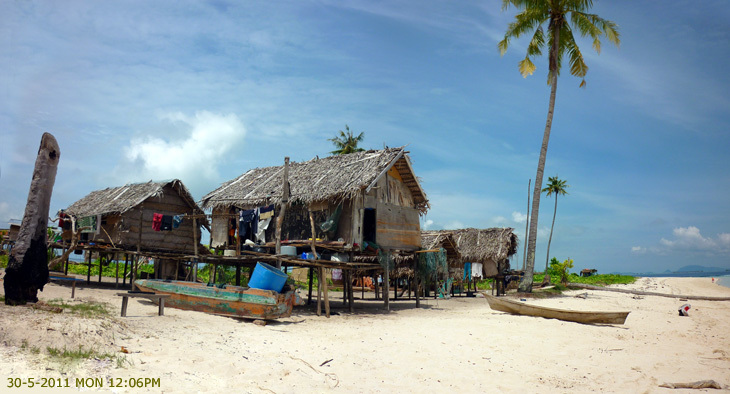 Around 2,000 Sea Gypsies live on the islands. 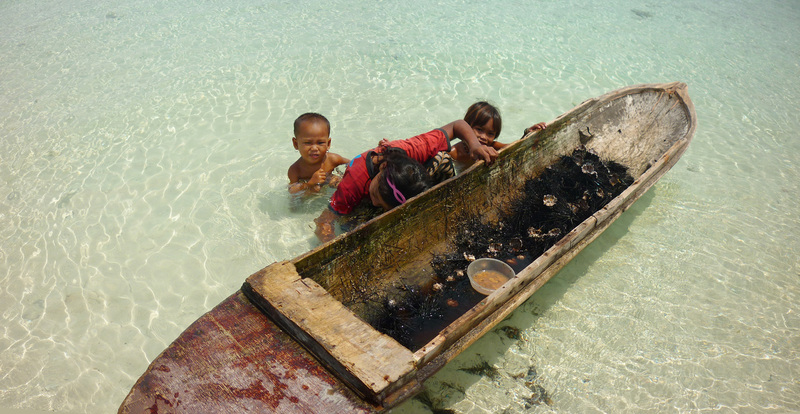 They are the Sea Bajau (Bajau Laut). 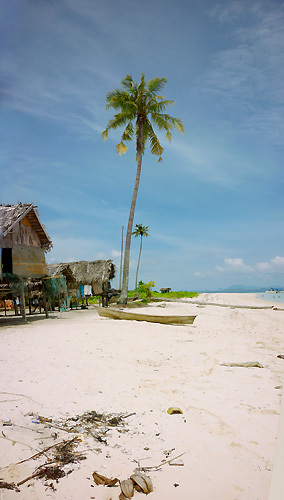 Bajau Laut carved wooden boats define their very existence. These seafaring people are much cut off from mainstream civilization. Their unique nomadic seafaring lifestyle attracted adventurous travelers to their islands. In 2017, around 3.65 million tourists bringing RM7.7 billion revenue to Sabah alone.